This story was originally published in the spring 2012 issue of Harker Quarterly. The boys varsity basketball team had an outstanding season, making the semifinal round for the first time in school history, where they lost to rival Sacred Heart Prep, ending their season at 18-9 overall. Girls varsity basketball made it nearly as far, losing in round two 53-49 to finish with a 17-9 overall record, 7-3 in league play. Wrestlers Darian Edvalson, grade 10, and Corey Gonzales, grade 9, competed in the Central Coast Section championships held in late February at Independence High School, Edvalson in the 160 lb. weight class and Gonzales in the 106 lb. Though both lost their first round matches, “it was a great experience for both of them because they are young they have a chance to improve next season,” said coach Karriem Stinson. “Boys soccer had a successful season in terms of what our program is trying to accomplish for the next few year,” said Shaun Tsakiris, the team’s coach. “Our soccer program continues to grow as we gain more and more interest about the sport on our campus. Our JV team had the best year in five years, and the coaching staff is really looking for our younger players to continue to develop and contribute in the years to come. “Our season was not as successful in terms of wins and losses as we would have liked. Giving up points on a few tough home matches put us out of contention for playoffs which was disappointing, but our boys continued to show great personality, attitude and desire to improve throughout the season. My goal as the head coach at Harker is to continue to develop the soccer program and I think we are on the right path!” Tsakiris concluded. The lady Eagles won a key first-round game at a tournament in Bakersfield and finished fourth, and finished the season in third place at a tournament at Skyline, securing one first-team All-League player, three second-team All-League players, and a couple of honorable mentions. They finished the league season at 10-4-2, with an overall record of 11-6-3. We had great results in lower and middle school sports this season. The grade 7 girls basketball team are champions, grade 5 girls basketball took second in championship play, and both the grade 7 and junior varsity B boys soccer teams finished first in their leagues. Congratulations to all hardworking teams, coaches and, of course, the supporting parents! Grade 8 (varsity A) girls basketball had a bit of a rough season but they never gave up and demonstrated amazing determination and fortitude. There was a vast amount of skill development and improved knowledge of the game demonstrated over the course of the season, and their coaches are all very proud of their effort and positive attitudes. Their final record was 0-9. The Grade 7 girls basketball team (varsity B) finished the league season with a record of 7-2, good for a second place finish in WBAL regular-season play. They advanced through the playoffs to the championship game and defeated Priory in the finals of the WBAL tournament in mid- March, 18-10, to take the tournament championship, finishing 10-2 overall! The Grade 6 girls basketball team (junior varsity A) finished the league season with a record of 6-3, earning them a fourth-place finish in the WBAL regular season. They lost early in the playoffs but triumphed in the consolation playoffs, taking first. Grade 5 girls basketball (junior varsity B) finished the league season with a record of 5-1, earning second place by making the championship match in March (see the cover photo)! Their 28-6 victory over Woodland put them in the semifinals; then they defeated St. Matthews 41-14 to put them in the big match. After a tough game, they lost 18-10, but grew a foot along the way! Their final record is 7-2, with second place in league and second place in the WBAL tournament. The junior varsity C girls basketball team finished with a record of 2-4. 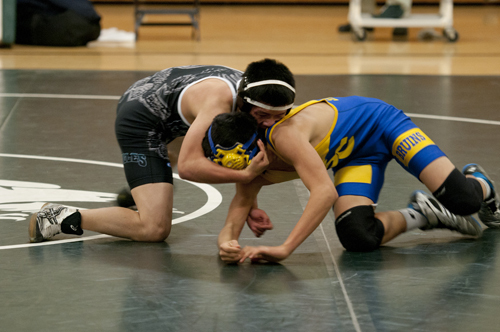 Grade 6-8 wrestling had two matches this season. In the first they had consistent winners (6-0, 5-2, 4-1, 2-1, 2-1), but didn’t have enough wrestlers in any weight class to claim a victory. They participated in the New Brighton Classic on March 17 at Soquel High School, but results were unavailable at press time. Wrestler is Harker’s First League Champ; Girls Hoops Finish Season 19-3!